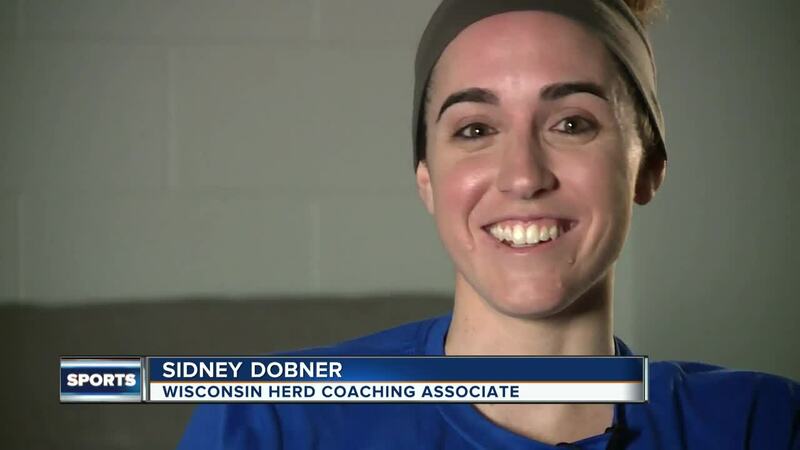 Now a coaching associate for the Milwaukee’s G-league affiliate, the Wisconsin Herd, Dobner is the first woman to work in the personnel or coaching departments in the Bucks organization. The 27-year-old is one of just five women working full-time in a coaching role in the NBA and G-league. That was all Sidney Dobner could think as she stood on a Bucks practice court, working out players, including the Bucks’ all-world forward Giannis Antetokounmpo. Less than a week prior, the Newbury Park, Cal., native had seven ulcers removed from her stomach. But Dobner wasn’t about to let that get in the way of her once-in-a-lifetime job interview. After a flight delay caused her to drive from Chicago to Milwaukee, she said she had thrown up in her hotel all morning and during breaks between players’ workouts in the gym. But she kept coming back. “Wow great job,” Dave Dean, GM of the Wisconsin Herd, the Bucks’ G-league affiliate, told Dobner after the workout in Milwaukee. “Really? I didn’t have my usual energy,” Dobner replied. But before Dobner flew up for that tryout, she had already left a lasting impression on Dean and Bucks GM Jon Horst. She was just getting into the coaching realm when she got involved with helping NBA prospects on the court during pre-draft workouts in Thousand Oaks, Cal., with the Creative Artist Agency. She worked with the likes of 2017 first-round pick Donovan Mitchell, 2018 first-rounder Grayson Allen and 2018 second-rounder Devonte’ Graham. At the time, with dozens of NBA executives and scouts watching, the furthest thing on Dobner’s mind was that she could be scouted as NBA talent. Dean said she didn’t just stand out because she was the only female working the event -- she was charismatic, confident and commanding. “We weren’t there to scout the people working the players out, we were there to scout the players,” Dean said. “Have you ever considered working in the NBA?” they asked her. “I was like ‘Are you serious? Like, yes. That’s not even a question. Of course I want to do that.’ And next thing I knew I was flying to Milwaukee and putting guys through workouts,” Dobner recalled. Happening around the same time that Dobner was being interviewed, Becky Hammon was interviewed for the Bucks’ head coach vacancy. Horst told Dobner that her composure and confidence reminded him of Hammon, the longtime Spurs assistant. “Name drop Becky Hammon in an interview with me? I felt pretty good at that point, yeah,” Dobner said, laughing. After the Milwaukee tryout, Dobner was in the car in California with her grandparents, driving to see her cousin play baseball. Her grandma was telling “a long story,” so Dobner told her to hold on as she answered an incoming call from Wisconsin on her phone. It was Horst, offering her a gig as a full-time coaching associate with the Herd. But there was a point Dobner recalls not knowing what was going to happen in her career, or in her life. She played professional basketball in the Netherlands, where she said she started to realize she had no idea where that path was taking her. She took a road she calls “less-travelled,” playing college ball at San Francisco State University, Moorpark College, Cal State-San Marcos and the University of Regina in Saskatchewan, Canada. She came back stateside, when her Moorpark coach offered her a gig as the head assistant coach at Division III California Lutheran University. She also coached club basketball for third- to eighth-grade boys. Then, she graduated to the seven-footers at the NBA pro day. She still wasn’t sure where the path was taking her, but her favorite aspect of coaching remained the same at all those levels. In Oshkosh, Dobner clips film for halftime review on game days and works with players on the court during practice and warmups. She’s learning about player development, the front office, coaching, video, and now, the media. She often says “I speak basketball,” so she’s never had an issue asserting her knowledge and passion for the game with male players, at any level.